The first female Nigerian Ambassador to France in a nutshell. Few foreign students in Paris ever meet their country's ambassador, but I'm lucky to have met two. My father's good relationship with the Nigerian embassy in Paris allowed me this opportunity. I met Ambassador Irele briefly towards the end of last year. She was having tea with my father and I arrived wearing large, black joggers, a black sweatshirt, a parka jacket and a pair of boots. My father introduced me as, "my daughter who likes to dress like a punk." I made a much better impression when my father returned in January 2018. The ambassador and I spoke about Chimamanda Adichie's recent visit to France and the journalist, Caroline Broué, who presumingly asked Adichie if there were libraries in Nigeria. The ambassador asked me about my future and I expressed my interest in journalism and African Studies. I also was fascinated by the fact that a woman was representing one of the largest countries in Africa. She told us about her experience of seeing her own portrait on the wall. A few days earlier, Dr. Irele had walked down a corridor at the embassy and noticed that something was different. She'd known this corridor since presenting her letters of accreditation at the Palais de l'Elysee in September 2017. The pale carpet, the walls, the portraits of past ambassadors, all were the same - yet something was subtly different. Her picture was now on the wall, but all 13 of the previous ambassadors had been men. Dr. Irele's appointment had broken a precedent: a woman's face had joined those of the preceding patriarchs. All the ambassadors seem to have brought their personalities into their portraits. While some wore suits, others wore full traditional attires to represent their specific cultures. Dr. Irele was wearing a traditional Ankara outfit, with a headgear and sitting behind her desk - the bright peach wall matching with her outfit. Ankara is a type of material that is worn in West Africa and in Nigeria, it is not specific to a tribe. By choosing to present herself in a national attire, the ambassador is choosing to identify with being a Nigerian woman, instead of being Yoruba (her tribe). Dr. Modupe Irele became an ambassador because she wanted to make an impact at a "central level." As an ambassador, she has become a hub through which two countries are connected: Nigeria and France. "I see myself as a connector," she said. She is not a career diplomat, but the politically-appointed office has given her the opportunity to create a network with the different heads of embassies in Paris. She thinks of herself as a representative, who brings various sides together - government to government, people to people, business to business. What she finds most challenging and fulfilling is representing two sides in a sympathetic way, she tells me. Ambassador Modupe Irele obtained her Bachelor's degree from the University of Ibadan, in south-western Nigeria. Before changing her major to French and minor to English, she studied English at the Ife University. Subsequently, Dr. Irele earned a master's degree at the University of Ibadan. Fifteen years later, after a successful career in banking, she returned to her studies at the University College, Dublin, where she received a second master's degree. She continued with a doctorate at Penn State University, where she focused on online learning and teacher training for adult education. "STUDENTS ARE OFTEN JUST MOVED ALONG WITH THE WIND AS OPPOSED TO BEING PURPOSEFULLY INVOLVED IN THE DIRECTION THAT THEIR LIFE IS TAKING." After her PhD, Dr. Irele went into educational consulting, helping students in their last years of secondary school with English-writing programs. She wanted to encourage them to take charge of their own education. She worked with students who wanted to study in America, guiding them through the labyrinthine application processes, along with helping them to find the right universities and funding. After a short-term career in teaching both in her alma mater, University of Ibadan and Ibadan Polytechnic, she realized that she wanted to go into business. She decided to go into retail banking, working in different banks and departments. "I really enjoyed this," she says. She describes her career as being " very eclectic." "I was in correspondence international banking, then I was a treasurer, then I was in charge of the bank networks, then I was in planning." She eventually rose to the rank of Assistant General Manager, in charge of the whole bank network. This made her an excellent candidate for her job now by allowing her to coordinate an entire network and be in charge of all day-to-day activities. The portrait on the wall is a big achievement. As the first woman on the wall, Ambassador Modupe Irele expresses that one day, she hopes to see other women there too. Her willingness to help and encourage other women is inspiring, as I believe women are constantly competing and fighting against each other instead of standing up and supporting one another. 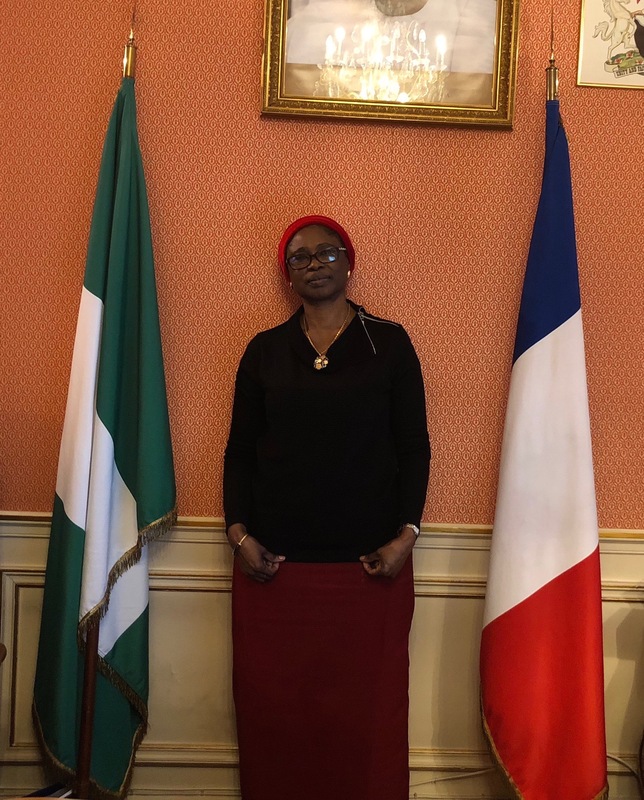 Being Nigeria's first female ambassador to France, she has cracked a hole in a wall and inviting young Nigerian girls to grab their own hammers and join her.